This protein bar recipe mimics Peanut Butter Clif Bars. 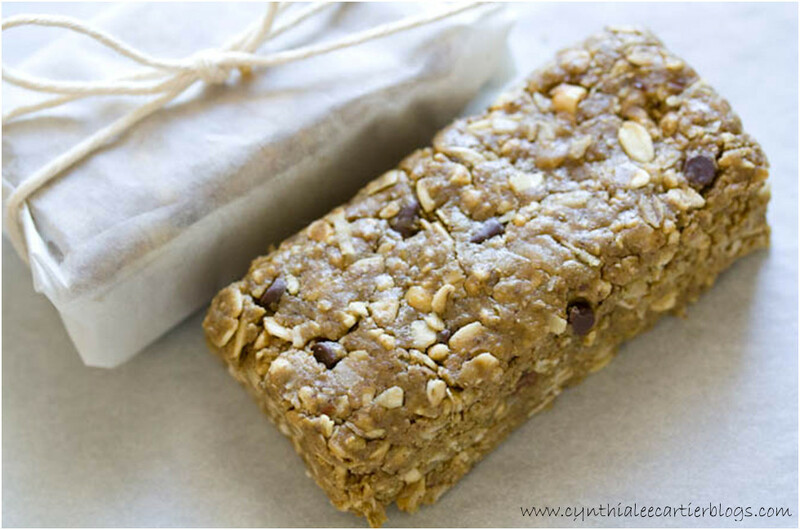 Protein bars are great quick snacks, backpacking food and take-along-fuel-on-the-go. In a food processor, process oatmeal and rice cereal until mixture becomes a coarse meal (if some of the ingredients are still whole, that’s fine – don’t keep processing and make a powder). Transfer mixture to a large mixing bowl. Stir in coconut and protein powder. In a separate bowl, mix together crunchy and creamy peanut butters, agave nectar or other natural sweetener and chocolate chips. Add peanut butter mixture to dry ingredients in the large mixing bowl – incorporate well. I find that clean hands are the best way to combine the ingredients. Pat mixture into an 8 x 10 glass baking pan and press down firmly (making sure the mixture is well pressed into the pan is key to a solid protein bar). Cover and let set for about an hour. Leave covered in pan and cut as needed, or cut into bars and store in an airtight container, or individually wrap in parchment or other wrapping material.